She is our third winner of a family four-pack of tickets to see Ringling Bros. and Barnum & Bailey Circus! Remember, you still have one more chance to win! Our last winner will be chosen next Wednesday, and the winner will be drawn from our hot spot entry, Gines Auto Service. You can also still purchase tickets for the show! Thanks to Ringling Bros. for providing the tickets for this giveaway! • Vasily Trifonov originally considered attending medical school before he decided to enroll in Circus College. Stanislav Knyazdov had entered the Moscow Geological Research Institute but also decided to attend Circus College. • Stas and Vas met while attending Clown College and were paired up as a duo by their professor and have been working together for more than 10 years. 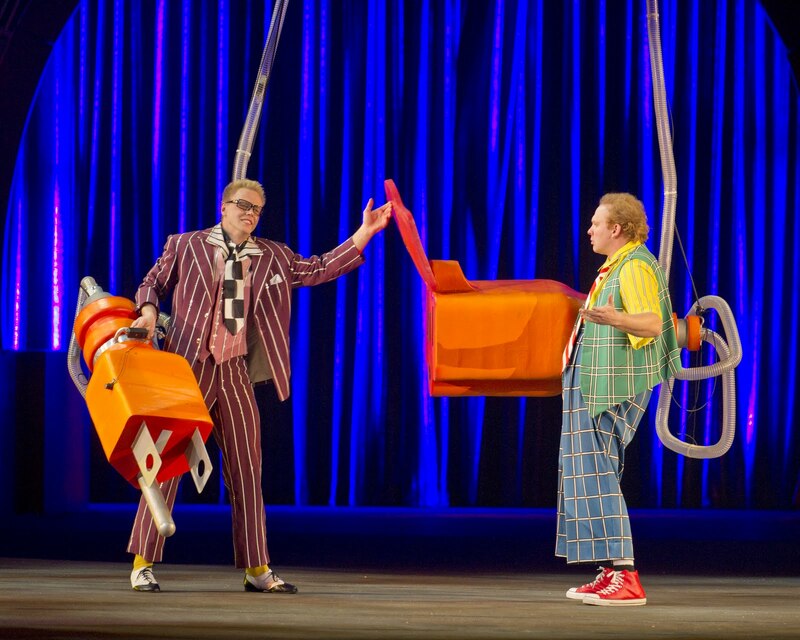 Stas and Vas are the “power duo” of the 141st Edition, Ringling Bros. and Barnum & Bailey® Presents FULLY CHARGED as their fully-charged antics deliver mega- watts of laughs, reminiscent of comedic greats such as Laurel and Hardy and Abbott and Costello. While Stas carries the energy in as the Assistant Ringmaster, Vas carries the energy out as the Assistant to the Assistant Ringmaster. The duo are an electrolyte bath of antics as they race about the ring like electron particles, one negative antic by Vas balanced by Stas’ positive that produces a megavolt of raucous fun. These aren’t just a couple of guys clowning around; Vas and Stas have been honing their act for over a decade. The chemistry between this duo is a volatile performance of acid- laughter and sulfuric-fun. Nothing in their childhood would have led their parents to believe they were going to become clowns.Vas, Vasily Viktorovich Trifonov, was born May 16, 1978 in Yurga, Russia and was the youngest of three. His father was an engineer while his mother was an accountant and economist. After finishing school, Vas considered medical school, but decided to enter Circus College to become a clown. “As a result, an outstanding surgeon was lost for the world.” But Vas was only one part of the unit of this electromotive force. Rewiring proven acts, with some twists to make them fit for FULLY CHARGED, the duo are nothing short of a great laugh.